Discover the best ways to get from Lima to Machu Picchu in 2019. Public bus, hop-on hop-off bus, train or plane. We have all of the info! This is the most complete guide ever written for Lima to Machu Picchu options and it is updated every 3 months by our local Peruvian experts, so please do take your time to read in detail and don’t be afraid to contact us if you have any questions at all that we may help with. Go from Lima to Cusco by bus. The route via Huacachina and Arequipa is recommended. Go from Lima to Cusco by plane. By taking a plane direct to Cusco instead of a bus, you will need more time to acclimatize to altitude. Take a tour or trek from Cusco to Machu Picchu via Ollantaytambo. Now, let us show you how to get from Lima to Machu Picchu in the best way possible to suit your itinerary and budget by analyzing the options to get from Lima to Cusco, and then the options of Cusco to Machu Picchu. So to get to Machu Picchu from Lima, first you need to get to Cusco. Cusco is separated from Lima by the Andes Mountains as you can see by our map. As well as this, Cusco is almost 10,000ft above sea level. This means altitude problems often affect tourists who go directly to Cusco and altitude sickness is very common…some more severe than others. 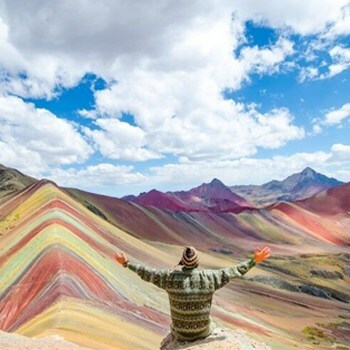 Experts recommend to take a bus to Cusco (stopping along the way) as the ascent to Cusco is then more gradual and recent statistics launched by the Peruvian Tourism Board have shown that bus travelers are 3 times LESS likely to be affected by altitude than those who travel via plane. Buses in Peru are very safe as long as you go with formal companies. The accidents that do happen are with informal companies (often the cheapest priced companies). Informal companies offer low low prices compared to the best companies such as Peru Hop or Cruz del Sur, and so be wary of these companies, as they often cut corners on safety to reduce costs. QUICK TIP : The best way to get to Machu Picchu from Lima while seeing some of Peru’s hidden gems is by traveling with Peru Hop. This route takes you south from Lima to Nazca and then starts its ascent through the Andes mountain range, passing Abancay before arriving to Cusco approximately 22 hours (yes twenty-two) hours later. This is the fastest way from Lima to Cusco by bus, however it has a bad reputation. There have been many reports in the past about bus crashes along this route. The winding roads are both curvy and steep and can be especially dangerous in rainy season. It is best to avoid this direct route to Cusco. This route takes you further down south from Lima to Arequipa and then takes you back up North from Arequipa to Cusco. This road is much much better and there is also a LOT to see along the way. 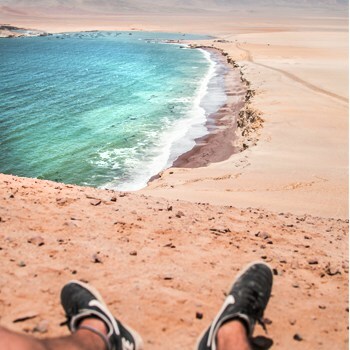 Recommended stops include Paracas, Huacachina, Arequipa and Puno if you have time. This is the most common route taken in Peru by tourists (it is often called the gringo trail) and exposes tourists to the beauty of Peru along the way to Machu Picchu. It is possible to do this route, with overnight stops along the way, in 3days/2nights, and so if short on time, combine this with a 1 or 2 day Machu Picchu tour from Cusco and you could see a LOT of Peru in just 1 week. Booking on the Peru Hop website is straightforward, but there are a lot of passes available, so it is best to study which one suits you based on the amount of time you will have in Peru and how many amazing sights you can squeeze in to your trip. For those with a lot of time, the passes are hop-on hop-off valid for a year, so no issues there. To fully understand how Peru Hop works click here. Booking on their website is quite straightforward, and whilst they have don’t have excellent TripAdvisor reviews (79%), they are still definitely one of the best bus options in Peru. The Full South to Cusco pass is the best option to get to Machu Picchu without missing out on any of Peru’s other hidden gems along the way. There are a few airlines that offer the Lima to Cusco flight option, but the best, by far, is LATAM. Peruvian Airlines and Star Peru are local airlines that operate routes Lima to Cusco however they are known to cancel/delay flights due to bad weather as their planes are not equipped for these conditions. If you are nervous about flying, then it may be best to avoid Lima to Cusco by plane. As the flight has to cross over the Andes Mountains, and then land into Cusco which is over 10,000ft above sea level, turbulence is very common. This mixed with Cusco’s rain and stormy weather, makes for some nervous moments, although Latam’s safety record is absolutely excellent. One of the biggest issues with flying from Lima to Cusco is the altitude and the fact that you have gone from sea level to 10,000ft+ in just 2 hours. This is not good for your body and is the reason why approximately 75% of tourists report feeling ill in their first 2 days in Cusco after a flight from Lima. If you plan to travel by plane, book well in advance but do try to at least maybe do some day trips from Lima to see other parts of Peru as well, as it would be a shame to come to Peru and “only” see Machu Picchu! Train enthusiasts might get disappointed when visiting South America because there aren’t as many trains in operation here compared to Asia, Europe or North America. Although uncommon, there is a way to take at least part of your trip by train. Ferrocarril Central Andino is a tourist train that leaves once a month, yes you read that right … Once a month. 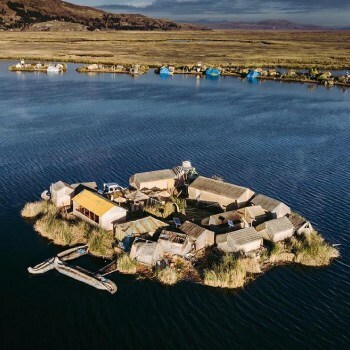 The company only travels from Lima to Huancayo and back and it takes approximately 14 hours to get there. Huancayo lies about one third of the route away from Lima, so from there you would have to take local buses and eventually join the Abancay-Cusco route. The train costs minimum 50 dollars to Huancayo. Another possibility is taking the south route through Arequipa to Puno and taking the train there to Cusco. The train from Puno to Cusco is the Andean Explorer, a luxury tourist train that will take approx. ten hours to get to Cusco during a scenic day trip. Fares are quite expensive – a one way trip will cost you at least $220, it is a very luxurious experience. So whether by bus or by plane, you have made it from Lima to Cusco! Now it is time to get from Cusco to the incredible Machu Picchu. Machu Picchu lies about 80 kilometers northwest of Cusco, however although that sounds close, it is actually quite far given the Andes Mountains are blocking a direct route! This is by far the most famous way to get to Machu Picchu and the most famous trek in South America. Because of erosion concerns, only 500 people are allowed on the trail each day and that’s including porters and guides. Since it is so exclusive, it is necessary to get a permit to trek the trail. To secure a permit you must book six months in advance and it is expensive – a whopping 650-1250 dollars! If you are willing to plan that far in advance you will not be disappointed. 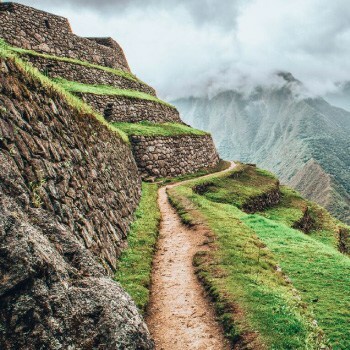 The trail winds through the Andes overlooking snow-capped mountains as well as cloud jungle forest.As if the journey isn’t spectacular enough, you will arrive to Machu Picchu just in time to watch the sunrise from the sun gate. Most Inca trail treks are 4 days with three nights camping but there are options for 2, 5 and even 7 days. The difficulty of the trek is moderate to hard. The Salkantay trail is a good alternative for those not wanting to wait six months to see the citadel. Salkantay is the name of a mountain in la Cordillera Vilcabamba. It is worshipped by locals and is means savage .. If you do this trail, you will find out why. The Salkantay pass takes you to altitudes above 4600m, which makes the already challenging trail that much more difficult. Prices range from $230 to $300 for a 4-day hike that you need to book a few days in advance. 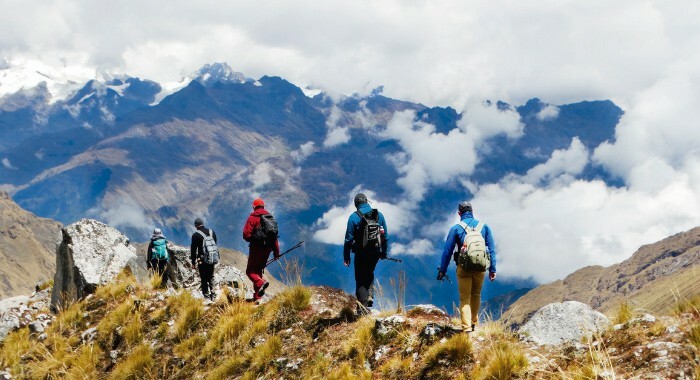 If you aren’t an experienced trekker and walking for four days straight isn’t your cup of tea, maybe the Inca Jungle Trek would be perfect for you. It is the most varied trek out there and with prices ranging between $220 and $300 it is also the cheapest. 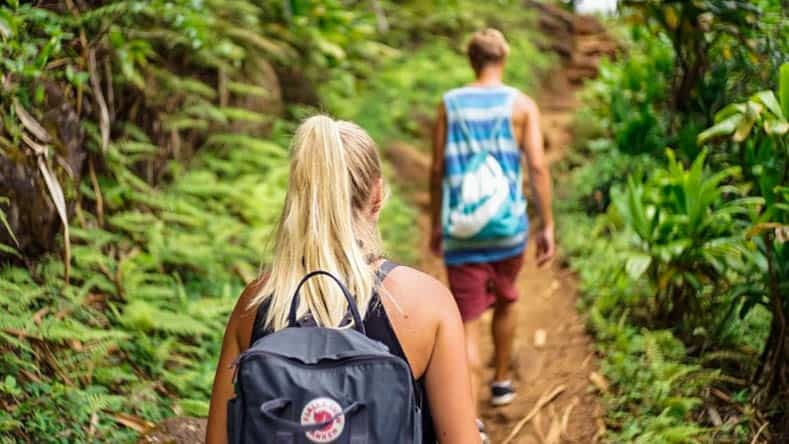 This trek offers biking, hiking, ziplining and rafting on your way to Machu Picchu and hiking or camping equipment are not essential because you only do a short amount of trekking and overnight in basic hostels along the route. Ask other travellers which companies they used and check TripAdvisor to view other reviews. If you don’t have time to spend a day interrogating tour operators in Cusco, check FindLocalTrips.com, which lets you compare operators’ itineraries and prices all in one location. Everything is in clear English too, which is not always the case when contacting tour operators directly. Avoid companies like G Adventures, Bamba Experience, Intrepid etc – their markup is more than 100%. If you go directly to the trek operators (e.g. 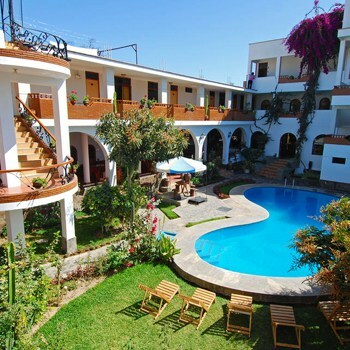 via their websites or with www.findlocaltrips.com then you will see the prices are usually a LOT cheaper. Make sure you know what your tour includes. Every good trek to Machu Picchu will include your entrance ticket to Machu Picchu (with option for Machu Picchu Mountain or Huayna Picchu), your accommodation, food (with exception of the last day) and your transport back from Machu Picchu to Cusco, usually by the train. It is a full on hectic but exhilarating day, if you prefer you can also spread the journey over two days for a similar price, spending the night before visiting the complex of Machu Picchu in Aguas Calientes town. A 2day/1night Machu Picchu tour is usually more popular than a 1 day tour as it is at a more relaxed pace and you can see more things. Editor Note: It is NOT recommended to follow this route due to safety concerns and accidents in the past. We STRONGLY recommend to book a tour or trek with a reputable company. Again we advise the use of www.findlocaltrips.com to help you find the best trip for you. To get to Machu Picchu cheaply you need to combine a couple of different modes of transport. Firstly take a taxi to the Santiago Terminal in Cusco and get a local bus to Santa Maria. It is advisable to know the exact bus times in advance or to go really early. Upon arrival in Santa Maria you can continue your journey immediately to Santa Teresa. There are a bunch of minivans stationed on the square in the town. They will take 45/60 minutes of bumpy road through the jungle to Santa Maria. Here in Santa Maria you then need to book a taxi to Hidroelectrica. Be aware that the roads between Santa Maria, Santa Teresa and Hidroelectrica are in really bad condition and the minibus vans or taxis will take you along sheer cliff-sides and hairpin turns, accidents are not uncommon. This is extremely dangerous in the dark and during rainy season, do exercise caution when considering this option. 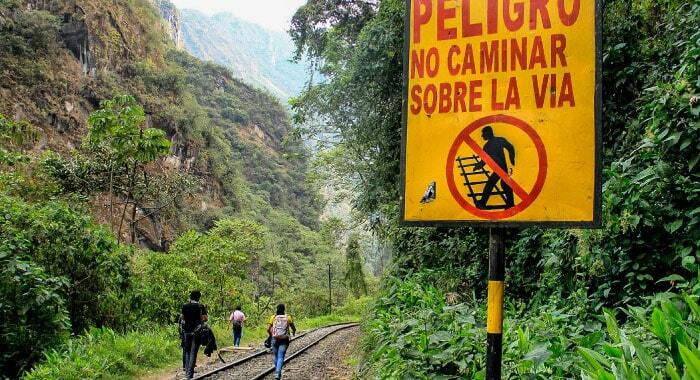 From Hidroelectrica you will follow the Inca train trail tracks by foot (the road ends here) to Aguas Calientes. It is a flat hike and should not take more than 3 hours. Be sure though to leave early enough so you don’t get stuck walking in the dark. Also avoid getting hit by the train and watch out for packs of stray dogs. By bus: It is recommended to go really early in the morning to Machu Picchu so you can start waiting in line at 4.30-5.00. The earliest bus leaves at 5.30 and the latest at 15.30. A one way ticket costs 12 dollars. On foot: the walk up Machu Picchu is basically a really long stairs. It is quite demanding but if you take your time and leave around 4-4.30, it should be manageable. 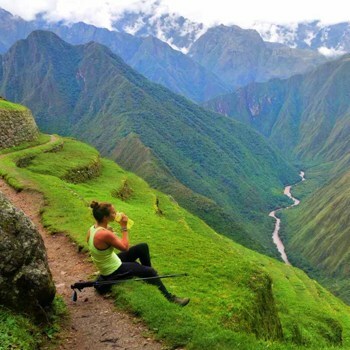 You could see it as part of your experience or maybe you want to keep all your energy for exploring the complex itself or your hike up Huayna Picchu or Machu Picchu Mountain. 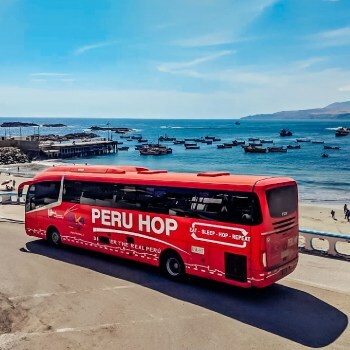 Private Bus with stops – you can search Peru Hop tickets here. Choose whatever pass suits your time schedule.